Everyone loves appetizer meatballs, so give them a new recipe to rave about. Our oven-baked Peanutty Turkey Meatballs come with a side sauce for dipping - an easy appetizer with an Asian spin. Mix turkey, 3 Tbsp. peanut butter, onions and 1 Tbsp. soy sauce until well blended; shape into 20 balls. Place in 15x10x3/4-inch pan. Bake 15 to 20 min. or until done. Meanwhile, mix remaining peanut butter and soy sauce with water and dressing until well blended. 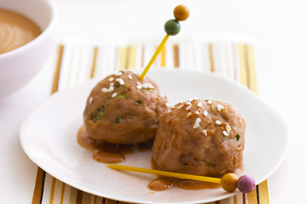 Sprinkle meatballs with sesame seed. Serve with sauce. Fresh ground turkey meat is a great-tasting, low fat alternative to ground beef, pork and chicken. It's extra lean and an excellent source of protein, phosphorus, zinc, vitamin B12 and niacin. Ground turkey is also tasty in spaghetti sauce! This flavourful recipe uses peanut butter in place of added fat to help you eat right.